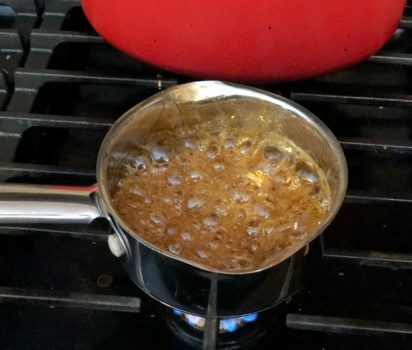 We’ve all got cabin fever due to this polar vortex that we’re experiencing so I figured it was the perfect time to create our own Cabane à Sucre and make some maple syrup taffy at home! 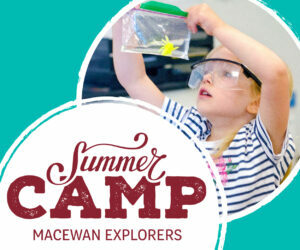 After visiting a few winter festivals with a Cabane à Sucre as one of the activities, I realized just how easy it was to make maple syrup taffy and my mind was blown. Stir your maple syrup as it starts to bubble and if you are using a candy thermometer you’ll want your maple syrup to reach between 235°-24o° F. If you don’t have a candy thermometer getting it to boil like the picture above can be done in about 5-10 minutes and you can also try the cold water candy test where you drop a tiny bit of your boiled maple syrup into some cold water and if it forms a soft ball it’s the perfect temperature. Now it’s time to pour the maple syrup on the snow. 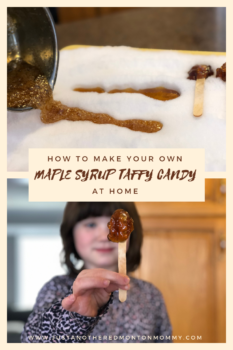 You’ll have to work quickly to roll the syrup on a stick but if it does harden that’s okay because it makes some delicious candy too! If your kids are like mine you’ll probably do this a few times because it’s fun (and there’s sugar involved). 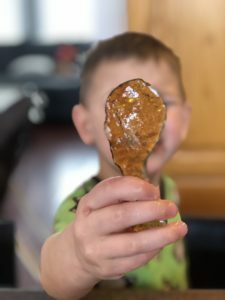 Have you made maple syrup taffy candy before?